National Co-existence Dialogue and Official Languages Minister Mano Ganesan yesterday said that his party will extend support to the UNP to form a government if the SLFP is going to form a government as claimed by State Minister Dilan Perera. Minister Ganesan while refuting allegations that the UNP had a secret deal with former Economic Development Minister Basil Rajapaksa said that the UNP has had no deal with anyone but the people of this country. He said that key national issues can be addressed only through the national government. Addressing the media at the Upcountry New Villages, Estate Infrastructure and Community Development Ministry yesterday, the minister emphasised that leaders of the Tamil Progress Alliance (TPA) support the national government and added that this government is a stable one and will last until 2020. He said several people falsely allege that the government’s constitutional reform can divide the country. “MP Wimal Weerawansa, MP Udaya Gammanpila, MP Dilan Perera and Ven. Gnasara Thera are very well aware that the proposed constitution is not going to divide the country. But, it is their personal agendas and politics that drive them to make these false allegations,” he said. Minister Ganesan said that the recent remarks made by MP Dilan Perera are very disappointing. “Now, the government is comprised of both the SLFP and UNP. Therefore, solutions to the prevailing national issues can be arrived only by the national government,” he said. The minister said when the 1987 Provincial Councils Act was brought, the SLFP was against it. They used the same slogan that the government was planning to divide the country. However, today seven of the nine provinces are led by SLFP leaders. Referring to MP Dilan Perera’s statement that the SLFP will form a new government; Minister Ganesan said if such a situation arises the Tamil Progress Alliance (TPA) will extend its support to the UNP to form a separate government. He noted that ther Tamil Progress Alliance supported the President during the 2015 election and a majority of the Tamil votes were cast in favour of him. 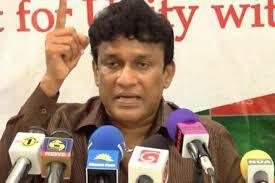 “Therefore, there are possibilities to form a separate UNP government,” Ganeshan said. Responding to a question raised by a Journalist about MP Dilan Perera’s statement that the UNP has a deal with Basil Rajapaksa, Minister Ganesan said it is MP Perera who often speaks about deals and he is very well known as “Deal Dilan”. “Basil Rajapaksa has no deal with UNP but I think MP Dilan Perera has a deal with Basil Rajapaksa”, he said. Responding to another question by a journalist about the stance of President Maithripala Sirisena on this issue as MP Perera is the SLFP Media Spokesperson; the minister said that MP Perera does not represent the views of the SLFP or the President. “We will be talking to the President on this issue very soon”, he said.